Caught By a Credit Card Phishing Scam: Now What? You thought you were responding to an urgent message from your credit card company when you followed the directions in an e-mail asking you to confirm security information for your account. In a hurry, you clicked on the link in the message, and typed in your name, credit card number, and other information on a Web site. But later you realized there was something fishy about that e-mail, and you wonder if you swallowed a scammer's bait. Phishing messages claim to be from organizations, such as banks or credit card companies, and usually direct recipients to a Web site where they're asked to type in personal financial information. 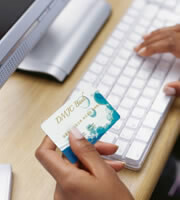 Crooks then take the information to run up phony credit card charges, drain bank accounts, or open fraudulent accounts. 1. Call your credit card company immediately and tell them that your credit card account may have been compromised. 2. Cancel that credit card number and open a new account. 3. Go to your credit card companies' Web sites and sign up to view your account statements online, if you haven't already done so. Monitor all your accounts frequently, particularly the one that was compromised. Call your credit card company to dispute any unauthorized charges, and send a statement in writing as well. Your liability is limited to no more than $50 if your card is lost or stolen and is zero if the loss involves the theft of the number and not the card. 4. Take extra precautions against identity theft. Sign up for free transaction alerts with your credit card company to inform you if unusual transactions are made with your card. 5. Check your credit reports through AnnualCreditReport.com to make sure no accounts have been opened in your name without your permission, and consider placing a fraud alert on your credit reports, which requires creditors to confirm your identity before approving any new accounts in your name. Meanwhile, don't answer any more e-mails that purport to be from financial institutions and ask for sensitive information. Legitimate credit card companies do not ask for personal information by e-mail or phone. Log onto your credit card companies' Web sites or call credit card issuers directly rather than clicking on links provided in e-mails. 0 Responses to "Taking the Bait in a Credit Card Phishing Scam"